Excellence!! Note for note these instrumentals are "DEEP" and I love to play along with them still to this day. Very few songs reach that deeper place in today's music, but I put "Kristen and Jim", "Preludin Fugue", and "Cold Turkey" right up there with "Lenny" and "Riviera Paradise". It is very hard for any musician to find the opportunity to relate this kind of emotion in any release. I'm really glad that Clapton took this opportunity. This is Eric playing at his most poignant and powerful. I really cannot adequately describe how beautiful and sad this album is. It never fails to make me cry, with it's lush instrumentation and moving arrangement. On one selection, Eric swoops down to a barely audible whisper, ushering wrought emotive cries from his guitar and on another selection, he literally screams through an amazing solo. There is a sense of Eric working something through here and with the passing of his son Conor the year before, this comes as no surprise. Catharsis. Please buy this album and hear for yourself how a person can seamlessly become one with their music, this is a stunning piece of work. Highly recommended. This album is great because it has alot a emotional solo's in it like "New Recruit", "Kristen & Jim", "Preludin Fugue" and "Don't Know Which Way To Go" with blues legend Buddy Guy on guitar and vocals. Also it's a great sit down & relax kind of album. This soundtrack only gets a 9 from me because it lacks some of the excellent tracks that really evoke a lot of emotion from you such as Hendrix "All along the Watchtower" and Robin Trower's "Bridge of Sighs"
The soundtrack is just. Perfect! Eric Clapton is superb at touching people's feelings and he did that perfectly with this soundtrack. The first time I saw Eric Clapton's video clip: Tears in Heaven with the extracts from the movie, I was shocked. I never got this pictures out of my mind. I just sat there watching it and crying:) anyway, Tears in Heaven is my favourite song.it touches right into me,my heart and soul. Thank you Eric! For years the album I'd take to a dessert island if I only had one choice would have been Abbey Road...until I listened to the Rush Soundtrack for a year, now I've been listening to it every morning at work for years...gets my day going with the very best ever. And with the 10 minute Buddy Guy / EC duet...there's no topping this CD. Now, this is a CD I can heartily endorse. If you have not seen the film, PLEASE do so. It is extremely powerful. It makes me so grateful that EC was able to escape the life portrayed in it. For the most part, the music is very soulful and on the sad side; my favorite track on the disc is "Help me Up" and it amazes me that it has never been released other than on this soundtrack; it never fails to get me up to dance! 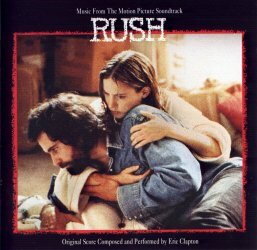 The original version of "Tears in Heaven", written for this film, is yet another example of how arrangements can change your feeling about a song. This is a disc that I come back to again and again. Do yourself a favor and give it a play; you won't regret it. This is the best soundtrack I have ever heard and EC's done a few... well a lot actually. The soundtrack ranges from some quite moody orchestrated quite, deep tracks to explosive emotional solo's that knock your socks off. There is also a great duet with the legend Buddy Guy. This a musical master piece, a must for any EC fan.